Reform legislation has stalled, and the private-prison industry is making obscene profits from a captive population. On a cool autumn night eight months ago, Ramon Mendoza Pascual ambled out of a bar in a blue-collar suburb outside Tacoma, Washington, and slumped into the passenger’s seat of his car. He had had a few beers and was not about to risk it all. So Mendoza Pascual did what he thought was the right thing: He called his wife to ask for a ride, then waited around as revelers poured out of the bar and carried their banter into the street. Mendoza Pascual was an accomplished builder who had just remodeled his family’s new home to perfection. When he was not on the job site, he volunteered his skills to Rampathon, a local charitable program that constructs wheelchair ramps for low-income disabled residents. His three children were born and raised around Tacoma and knew the United States as their only home. For his years of hard work and dedication to his community, Mendoza Pascual had a lot to show for himself. However, his status as an undocumented immigrant cast a shadow over his future. When Mendoza Pascual’s wife, Veronica Noriega, pulled up to the bar in the family minivan, the sidewalk was eerily empty. Her husband had vanished without a trace. A half-hour later, she was informed that he had been arrested on suspicion of driving under the influence of alcohol. Some neighbors had called the police to complain about the ruckus outside the bar, the cop swept loiterers up in arbitrary, over-aggressive fashion and now her husband was in a jail cell. And his nightmare had only begun. As soon as she appeared at the court to pay her husband’s $1,000 bail, Noriega was told that he would not be leaving prison anytime soon. Though a judge had cleared him of driving under the influence of alcohol, US Immigration and Customs Enforcement (ICE) placed an immigration hold on his case. That meant that Mendoza Pascual would be immediately transferred to the Northwest Detention Center, a vast immigration detention facility in Tacoma operated by a private prison firm called GEO Group. Eight months later, Mendoza Pascual still languishes in the jail. He has not been charged with any crime, yet he has no idea when he will be released. He has been indefinitely detained for living in the United States without documentation, and deportation to Mexico is a looming possibility. Mendoza Pascual’s plight is anything but unique in the Tacoma immigration jail. Having endured indefinite detention and inhumane conditions in the prison, from barely edible food to isolation and soul-crushing boredom to janitorial work for one dollar a day, he and hundreds of his cellmates recently resorted to the only means of protest available to them: refusing to eat. Starting in early March, undocumented migrants locked in the Northwest Detention Center battled back against their jailers with empty stomachs, launching a hunger strike that spread across the prison in a peripatetic but increasingly strategic fashion. The strikes spread to the GEO Group’s Joe Corley Detention Facility in Conroe, Texas, another privatized vessel of cruelty, where detainees have endured reprisals including solitary confinement and being shackled to steel beds. At the Northwest Detention Center, GEO Group and ICE stand accused of attempting to suppress the protests through a draconian regime of intimidation, locking strikers in solitary and even threatening them with Guantánamo Bay–style force-feeding sessions if they refuse to relent. Those confined to solitary have been relegated to cells for twenty-three hours a day with no reading material, television, radio or other diversions that might stave off the borderline insanity that accompanies sustained deprivation. In April, a group of immigrant rights activists staked out a patch of grass across the street from the White House. For weeks, they beseeched President Barack Obama to take executive action to slow the wheels of the deportation machine that has sent some 2 million immigrants away since his inauguration, including members of their families. Among the demonstrators was Ernestina Hernandez, the wife of a hunger-striking detainee at the Corley detention center. “Breaking up a family isn’t going to stop us from fighting. It’s going to make us stronger, and we’re not going to stop until the president takes action,” Hernandez told The Nation’s Zoë Carpenter. The hunger strikes finally ceased in early May, but not without substantial results. After visiting strikers inside the Northwest Detention Center, Washington State Representative Adam Smith introduced legislation that would answer many of their key demands. Called the Accountability in Immigration Detention Act of 2014, the bill would establish new mechanisms for oversight of prison conditions, limit the use of solitary confinement and completely eliminate a quota requiring ICE to keep at least 34,000 immigrants in detention. Angélica Cházaro, a University of Washington professor and immigration attorney representing several of the leaders of the hunger strikes in Tacoma, sees the legislation as a historic milestone in activism. “This is the most direct example I’ve seen of people directly affected by imprisonment possibly having a say in the laws that govern their confinement,” Cházaro told me. Cházaro pointed to National Council of La Raza president Janet Murguía’s labeling of Obama as “the deporter-in-chief” as further evidence of the impact of bottom-up organizing. With most immigrants held in the Northwest Detention Center unable to afford legal representation, they have turned to a coalition of legal activists like Cházaro to keep the pressure on ICE. Detainees’ families and former cellmates have assumed a frontline role in the activism, mounting boisterous demonstrations outside the jail that often transform into acts of full-scale civil disobedience. In a windswept parking lot next to a busy highway in Tukwila, Washington, I met a few of those who are leading efforts to support the hunger strikers. They had just wrapped up a demonstration outside the nearby Department of Homeland Security’s Seattle Field Office, the home of ICE’s bureaucratic parent. Among them was Maru Mora Villalpando, an undocumented immigrant and a leading member of the ad hoc #Not1More deportation coalition that coordinated the frequent demonstrations. On February 24, Mora Villalpando chained herself to other activists, blocking the road leading to the prison and obstructing the path of buses filled with shackled migrants. By her side was the wife of a detainee who was being held at the detention center. The woman threw her body in front of the bus while protesters advanced, forcing the vehicle to retreat back into the prison. It was a powerful symbolic victory that galvanized the protesters, both inside the jail and out. By March 21, the number of hunger strikers exceeded 750. As the national media focused in on Tacoma, Mora Villalpando and two local immigration lawyers attempted to initiate negotiations with ICE. Their demands were drawn up by the hunger strikers: an end to the indefinite waits for hearings, the solitary confinement regime, the medical deprivation and the callous and arbitrary separation of families. Instead of negotiations, they were met with an iron-fisted crackdown. During the height of the hunger strikes in March, prison guards burst into a wing of Northwest Detention Center where a despondent young detainee had just attempted suicide. The guards asked if any detainees wanted to discuss jail conditions with an assistant warden. When twenty men raised their hands, Mora Villalpando recalled, the guards immediately cuffed them and dragged them into solitary confinement, where they would spend twenty-three hours in near-total isolation. When five female detainees joined the hunger strike in late March, according to Mora Villalpando, they were locked in solitary for a week and barred from meeting with their lawyers. One of three original strikers, Jesus Cipriano Ríos Alegría, was placed in medical isolation, a practice applied to any detainee who refuses as many as nine meals. The longest-enduring hunger striker, Jesus Gaspar Navarro, lasted twenty-five days without food. As soon as he terminated his protest, he was locked in solitary confinement. Then the feeding tubes came out. Jose Moreno, a 25-year-old undocumented immigrant from Mexico who helped coordinate hunger strikes when he was detained at Northwest Detention Center, told me that guards attempted to intimidate hunger strikers into accepting food. They presented the detainees with stiff rubber feeding tubes, Moreno said, describing in explicit detail the process of jamming the long hoses through the esophagus and toward the gastro-intestinal organs. The numbers of strikers began to drop as detainees recoiled at the prospect of being subjected to such a violent practice. Yet the strikes continued, prompting further recriminations. According to Cházaro, GEO Group guards have barred hunger strikers from congregating in groups larger than two or three, and have transferred two leaders of the protests to other facilities. Detainees who have complained about doing janitorial work for only a dollar a day are now being given a single candy bar or a bag of chips for volunteer work, she told me. “It’s becoming clearer that the demands [the hunger strikers] made are only scratching the surface of the abuses,” said Cházaro. Despite attempts to sever lines of communication between detainees, they managed to coordinate the strikes through carefully timed calls to a local Spanish-language radio station, El Rey 1360 AM, using the airwaves to broadcast their situation to allies on the outside and offer directives to those fellow prisoners able to tune in. With each passing week, the strikes grew more sophisticated, with a new wing of the detention center joining the protest in staggered fashion as another group of detainees broke its fast. As the pressure mounted, ICE refused to budge. Instead of agreeing to negotiate with the strikers’ legal advocates, the agency relied on community roundtables initiated by activists. There, ICE representatives were able to project a sense of receptivity to grievances without assuming any obligation to act. At one such event on March 21, Mora Villalpando said ICE officials refused to allow the wife of a detainee to bring her daughter into the meeting, claiming the child would present “an unnecessary emotional distraction.” Claiming to be unaware of the detainees’ complaints, ICE representatives boasted throughout the meeting that the Northwest Detention Center was one of its premier facilities. What Smith witnessed at the prison moved him to introduce his Accountability in Immigration Detention Act. The bill would impose a rigorous regime of oversight on privately maintained ICE prisons and immediately shutter those that fail two consecutive inspections. However, according to legal advocates for the detainees, ICE officials offered them only a single concession. While the hunger strikers persevered throughout April against an intensifying regime of punishment and intimidation, GEO Group marshaled all the resources at its disposal to protect a growing enterprise. The abuses unfolding behind the razor wire–topped fences and pre-cast concrete walls of Northwest Detention Center are the inevitable byproduct of decades of anti-immigrant lawmaking, lobbying and corporate profiteering. Private prison corporations like GEO Group have yielded whopping gains during the Obama era, leveraging record levels of deportations overseen by the administration to win new contracts across the country. With hundreds of millions in taxpayer money channeled into company coffers each year, GEO Group has ratcheted up its lobbying efforts in Washington, joining with other members of the private prison industry to guard against financially damaging reforms. This year, the company shelled out at least $100,000 in lobbying fees, while donating even more to candidates in both parties. The year after DHS introduced this startling proposal, the Northwest Detention Center opened on a badly contaminated Superfund site in Tacoma’s Tideflats area. Over vehement public opposition, the Tacoma City Council approved the jail on the grounds that it would create “hundreds of family-wage job opportunities.” It was to be operated by the Florida-based Correctional Services Corporation (CSC), a private prison contractor eager to offset construction costs through public funding. An in-depth joint investigation by the Tacoma-based News Tribune and the nonprofit InvestigateWest found that CSC collaborated with local lawmakers to ensure that city taxpayers covered the bulk of costs associated with building the jail. In the end, only forty-five jobs arose from the prison’s construction—far less than the hundreds initially projected. Formerly a subsidiary of Wackenhut/G4S, GEO Group established itself as a fully independent corporate entity in 2003. In 2005, GEO Group acquired CSC, taking direct control over the Northwest Detention Center. Within five years, GEO Group had secured contracts to administer nearly 100 prisons across the country with room for at least 77,000 beds. Private prison industry profits have skyrocketed since 2007, when a bipartisan vote in Congress authorized a peculiar law known as the bed quota. The provision required the Department of Homeland Security to detain at least 34,000 people a day in federal immigrant prisons, imposing an incarceration mandate that remains unchanged despite declining levels of illegal immigration. According to Mora Villalpando of the #Not1More coalition, policies like the bed quota inspired ICE to classify any contact between undocumented migrants and law enforcement as “criminal activity.” And thanks to Secure Communities, a controversial program linking local police to the ICE database, beat cops have been transformed into de facto immigration agents. 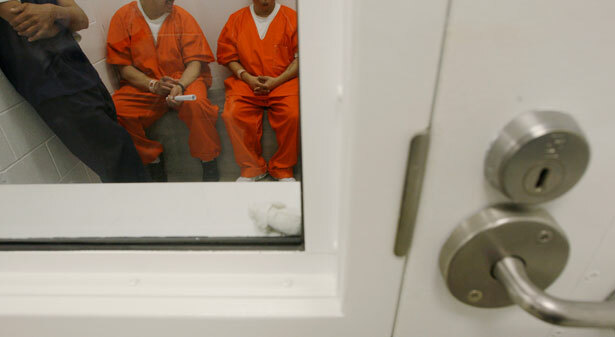 For the undocumented, an arrest for even the most minor offense could mean deportation, or least several months inside a prison like the Northwest Detention Center. In privatized jails, every body has a monetary value. Indeed, GEO Group bills the federal government $164 per day for each immigrant it holds. As a direct result of the bed quota, the cost of detaining undocumented immigrants to US taxpayers has spiked to $2.8 billion a year, over double what it was in 2006. The federal money flows straight into the coffers of GEO Group executives; their team of lobbyists at Navigators Global, a DC firm; and to Lionel Aguirre, another GEO Group lobbyist with a wealth of connections on both sides of the political aisle in Austin. In 2012, following three decades of skyrocketing incarceration rates and almost 2 million deportations since Obama’s inauguration, GEO Group announced a record $1.4 billion in profits. The company’s CEO, George Zoley, became the wealthiest correctional officer in America, raking in a whopping $22 million between 2008 and 2012 while his employees’ incomes stagnated and conditions worsened in his jails. In 2013, after spending over $1 million to lobby members of Congress, GEO Group announced it would not pressure lawmakers in any way over the immigration reform efforts proposed that year. However, as reporter Lee Fang revealed in The Nation, the corporation had already renewed its contract with Navigators Global in DC. Asked about GEO Group’s lobbying efforts, Paez insisted to me that his company hired Navigators Global to push for alternatives to detention like ankle-bracelet monitoring, a reform proposed by some members of Congress opposed to the bed quota. Paez freely conceded that GEO Group’s interest in detention alternatives stemmed not from humanitarian concerns, but from more profiteering. As he explained to me, GEO Group owns BI Incorporated, the firm that won a hefty contract from ICE to administer the high-tech surveillance program. “Our company’s discussions have been entirely focused on educating lawmakers on the benefits and successes of the Alternatives to Detention program since our company’s subsidiary is in fact the main provider of community supervision alternatives to detention,” Paez stated. Following on the heels of the private prison industry, companies like Talton Communications have moved in to exploit a literally captive market. A tech firm contracted by ICE to maintain for-profit telephone services at the Northwest Detention Center, Talton routinely absorbs telephone credit from immigrants who had been deported. According to Mora Villalpando, the company may have seized hundreds of thousands of dollars for deported former detainees. Other telecommunications firms like Global Tel*Link have been accused of charging $17 or more for each fifteen-minute long-distance call placed by detainees from immigration prisons. In January, after a lawsuit by telecommunications firms, the US Court of Appeals for the DC Circuit blocked substantial portions of an FCC order that would have limited the telecom industry’s price-gouging of prisoners. In 2013, the year after ICE detained almost half a million undocumented immigrants, federal spending on immigration enforcement reached a record high—over $3 billion more per year than it spent on all other criminal law enforcement activities. Even conservatives in Congress had begun to bristle at the Obama administration’s approach. “It looks to me like maybe there’s an overuse of detention by this administration,” GOP Representative Spencer Bachus complained during a House Judiciary Committee hearing. Months later, sixty-five House Democrats issued a letter to Obama demanding the repeal of the bed quota. The White House has staunchly refused to issue an executive order halting the mass deportations, with Obama deferring responsibility onto Congress for any reforms to the immigration system. One of the few reforms proposed by the administration arrived in a bloated 2015 Department of Homeland Security budget in the form of alternatives to mass detention—the kind that represent a cash cow to GEO Group subsidiaries. Buried in the budget request was perhaps the most significant clause: $1.3 billion to fund 30,539 prison beds, only a few thousand lower than the established bed quota. While Congress awaits a vote on Representative Smith’s prison reform legislation, the deportation machine’s blades spin with increasing ferocity. In Tacoma’s mostly Latino immigrant community, it seems that few families can escape the thresher. Wendy Pantoja Castillo is a recently naturalized American citizen from Mexico who has kept an unrelenting vigil at the Northwest Detention Center, joining the protests and visiting detainees whenever she can. She rattled off an almost endless litany of horror stories she gathered from her trips inside the jail. “Seeing the family separation is the hardest part of it all,” Castillo told me. Two years ago, Castillo rushed to Northwest Detention Center to search for a single mother who had just been detained by ICE. Having not been told that their mother was arrested and jailed, her despondent children were forced to wonder whether their mother had been involved in some kind of accident or abduction. When Castillo arrived at the jail, she said she had to help the woman arrange for a neighbor to adopt her children, who were born in the United States. In the end, the woman was deported, forced to leave her children behind for good. More recently, in February, Castillo escorted a family from the nearby town of Salem to visit their father in Northwest Detention Center. The detainee’s four children were American citizens, as was his wife. Separated behind a wall of blast-resistant glass, one of the detainee’s children, an autistic boy, began to sob uncontrollably. “He just wanted to touch his father,” Castillo said. “But the visits are noncontact. He could only cry behind the glass.” Several weeks later, the man was deported, prompting his family to give up on life in the United States to reunite with him in Mexico. During one of the protests in support of the hunger strikers, a young man who had just emerged from the jail approached Mora Villalpando. He explained that he had just visited his brother inside and that he had been detained there two years before him. Several years before that, he said, he was among the undocumented immigrants who were hired to build the prison. With congressionally mandated reforms on the distant horizon, a sense of siege has engulfed immigrant communities around Tacoma. Jose Moreno, the former prisoner in Northwest Detention Center, is among the swelling ranks of the undocumented trapped in a legal gauntlet. Initially arrested for driving under the influence, his detention by ICE prevented him from completing the intoxicated-driver classes he was sentenced to attend. As a result, a warrant was issued for his arrest. When he appears before a judge in the coming weeks to explain his extenuating circumstances, Moreno must prepare for the worst.